Our Easter sale is on! Get £100 off until 22nd April! Shutterly Fabulous has been rated by its customers "GREAT"
If it’s a toss-up between shutters vs curtains, or shutters vs blinds, it’s no competition. There are many benefits to shutters that drapes on their own simply can’t offer. That said, some customers occasionally consider doubling up and having shutters with curtains for a layered look. If you urge and dare to pair, here are some tips to ensure your endeavour to pair shutters with curtains is a style success and not a design disaster. The benefits of shutters with curtains go beyond the aesthetic value they offer. Shutters look fabulous on their own, but pairing with curtains offers double the benefits. Shutters help to insulate, soundproof and control light levels. Adding curtains to the mix further improves insulation and with thick lining they can provide a blackout effect. As well as keeping in the heat and reducing your energy bills, a shutter and curtain combo also assists in protecting your home from noise pollution and ensuring an improved night’s sleep. If you know you want your window dressing to pair shutters with curtains, get your shutters installed first. Why? Especially if you’re dressing bare windows, installing shutters will bring instant privacy to your home day and night – something curtains can’t. Getting your shutters installed first is an intuitive approach given there won’t be fabric or curtain poles to move and rehang. Having your shutters installed first means you can hang your curtain pole in the right location above the shutter frame. You can easily establish which shutter style is best for you by requesting our brochure for inspiration. A salient point to consider is choosing a more neutral shutter which could be easily adapted to other room designs and curtain patterns. If you want to resell your property, we recommend white shutters as a more diverse and adaptable colour than braver colour choices, but we do offer a full spectrum. Take a look at which shutter style you think would work best for you. Next, think colour, colour, colour! One of the more difficult choices can be deciding on what colours to opt for in your shutters and curtain combo. There are some simple tricks you can adopt for this. Shutters and curtains that are close in colour (neutrals for example) will give the room a brighter and more open feel, whereas bolder, contrasting shades will draw focus to the window and make a space feel cosier. If you are working with a larger space and want to choose two colours or a mix of patterns, then we recommend opting for a lighter shade shutter than the curtain fabric, for good balance. Choose darker shutters if you want the shutters to be a focal point in the room. Your choice of curtains should always come after you have selected your shutters. Curtains being typically drawn back in the day means you can opt for a more intricate or bold pattern without making the room seem too busy. 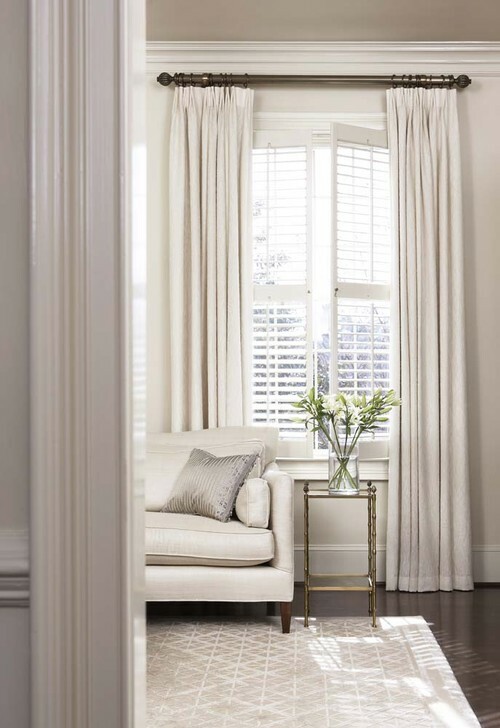 Some general rules which can ensure that your room appears consistently stylish when putting shutters and curtains together include having a high-quality curtain that is not transparent or opaque and generally opting for floor length. Sheer or see-through curtains can work in some circumstances. For instance, if you are never planning on closing the curtains and having them for merely decorative purposes, an opaque addition can look elegant and soften your space. While seemingly modest details, things like opting for grained Elm shutters, curtain finials and tiebacks can significantly change the look of your window dressing. Premium Elm shutters will give a subtly grained shutter look, and when paired with stylish tie backs, will always give the room a more up-market feel. In most cases, curtains will look better when left free-flowing and not tied back. But, if you want a room to reflect an opulent Renaissance vogue, tiebacks work well. When you are hanging your curtain pole, ensure it is long enough on wither end so that you can fully pull back your curtains and reveal your shutters beneath. It is also advised that the curtain rail should not be touching the top of the window and instead be hung a few centimetres above if it’s available to you. This lengthens the appearance of your window. Do always choose your shutters before your curtains as these will provide instant privacy and be the more permanent fixture in your room. Pale shades generally work best and you can always compliment a neutral shutter with a bolder curtain. Do make sure that you choose a curtain rail that is not only long enough to fully expose your shutters but also matches both shutters and curtains alike. Think about the finish and material as well as the colour for the best design fluency. Do make sure you measure for curtains carefully. Curtains with shutters work best when the curtain pole is raised higher than your window frame and when they fall floor length. Don’t be afraid of pairing shutters with curtains. While it might seem like an unusual style choice, with a little consideration it can be a fabulous and elegant feature of any room. Don’t install your curtains before installing shutters. You may find you need to move and rehang the curtain pole if the shutters need to be mounted nearby. You don’t want your curtain pole obstructing your shutter panels as they open. Don’t opt for two dark shades or bold colours of plantation shutters and curtains unless you’re happy with the room looking busy. Light coloured shutters and curtains always work well together. But, if you do want something a little more interesting, reserve this bold choice exclusively for the curtains.